This diploma focuses entirely on creative practical work using all of our Futureworks studios. On completing the course, you will feel confident in a broad range of professional recording situations. 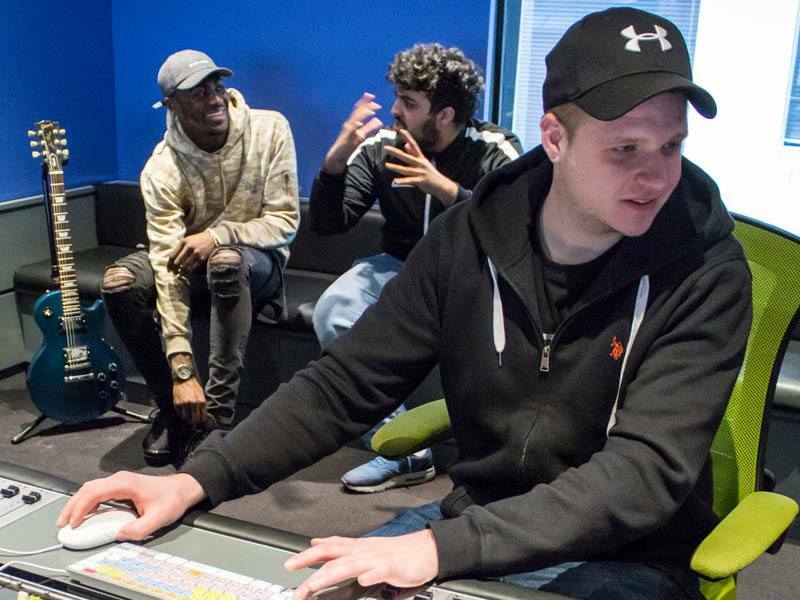 The course could serve as the start of a new career in sound and music production or as an entry point to our Audio Engineering, Music Production or Game & Interactive Audio degree programmes. The course consists of instructional lessons accompanied by real-world assignments which will take you on a creative journey through all of our studios, culminating in you at the helm of our Neve VR Legend desk, in our premium music production studio. Over the two years you will develop the sound recording, engineering and studio techniques needed to start your music production career. The course is structured logically and based on real-world workflows, to make you feel comfortable moving from recording to mixing for music, as well as to film and games projects. Included in your course is the opportunity to become an Avid Certified Pro Tools Operator (a worldwide industry recognised qualification) and become proficient in standard studio and session management techniques. The course starts with a simple recording project and develops to encompass sound for film, TV and games. By the end of the diploma, you will have engineered and produced a full album as well as created sophisticated audio for both film and game based projects. Our close connections with industry creates opportunities to work on a number of real-world briefs and develop valuable contacts as you progress through the programme. Our students tell us; the thing they enjoy the most about the course is escaping from the limitations of their own home studios and working in a fully professional environment. This new-found freedom, and the way the course is structured, opens up exciting and unexpected creative avenues as well as potential careers. This diploma takes a very direct approach to giving you everything you need to start a career in music and sound production. It is ideally suited to someone who wants an intensive ‘audio apprenticeship’, or someone who wants to enrol on an audio degree course but has not yet achieved the necessary academic entry requirements. Successful completion of the Diploma guarantees an entrance interview to join the second year of our Audio Engineering, Music Production or Game & Interactive Audio degree programmes. Alternatively, you may already have a degree and are considering a change in career. Many of our students work full-time and they are able to fit the lessons around their lifestyles. One of the many advantages of this course is that class sizes are limited. This means that the majority of lessons are conducted in the studio and the small class sizes give us the flexibility to change and adapt the course to the needs of individual students. This course is taught by our most industry focused tutors – still current and active in the audio business. They bring a vast amount of real-world experience to the programme as well as valuable contacts in the music, film and games industries, to bring the subject to life. Successful completion of this course prepares you for a wide range of roles within the creative industries. You could be working as a music producer, sound engineer or sound designer in recording studios, live music venues, film production companies and games studios. Futureworks students from our Audio Engineering and Music Production courses have gone on to work for a wide range of companies including: EA Games, Rockstar Games, BBC, VIP Nation, TT Games, Woodwork Music, See-Saw Films, Vertigo Films, Eve Studios, Blueprint Studios, Freelance Films, ITV, Sky Sports, Endemol, Sony, Fabrik Games, History Channel (Brazil), Amnesty International, UNICEF. Many others have forged successful freelance careers in sound.